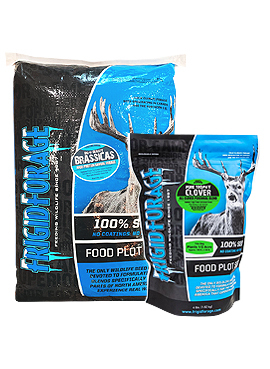 I noticed that you sometimes plant clover in your food plots for the Spring. Come Fall, do you leave the plots in clover? I tend leave my plots bare, kill off the weeds in late Summer and plant new plots (not clover) during that time. If you have limited plots what would you use for year round use? Generally, I will leave my spring planted clover plot in clover for the fall. In fact, clover will last three years if maintained correctly (mowed at least once per year, possibly sprayed for grasses annually and fertilized annually). If the clover is looking good, there is no reason to kill it and till it under unless you want to plant something like Big N Beasty there for the fall. Then, the clover becomes a valuable source of nitrogen for the nitrogen hungry brassicas. Your approach will work too, but I just like to have clover in some plots year around because it greens up fast in the spring and the deer hit it hard when they are coming out of winter. Also, it is very attractive during most of the fall. It is only the months of December – February when the clover is not hard hit in my area. That is when other plots fill the void (like Big N Beasty or grains like corn and beans).